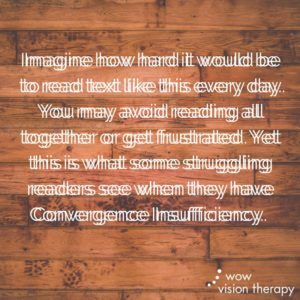 Convergence insufficiency (CI) is a vision condition that causes difficulty or inability to effectively converge or align both eyes together to perform near oriented visual tasks, like reading, writing or computer work. This condition directly affects one’s ability to read, focus and process information. CI occurs in both children and adults and can significantly handicap ones reading and learning abilities. Adults with CI often experience tired eyes and headaches at work, which reduces job performance and makes work unbearable at times. When developing CI later in life, teens and adults are often able to spot a visual problem because they have experienced normal vision before. However, when a child is born with CI, they are often unaware of the condition and are unable to explain why they are struggling with reading and learning. CI is a common vision condition that affects roughly 5-8% of the U.S. population. CI is not typically detected in a standard school vision screen. Even with 20/20 eyesight, an individual can still have CI or other vision-related conditions. ADHD is the most common misdiagnosis because there are several overlapping symptoms between convergence insufficiency and ADHD. Without treatment, Convergence Insufficiency does not go away on its own. Research shows that office-based vision therapy is the most effective treatment for CI when compared to all other methods. Furthermore, clinical trials have found home-based treatment models are significantly less effective than office-based vision therapy. At Wow Vision Therapy, we are a leading developmental and rehabilitative vision therapy practice. Our advanced office-based approach goes beyond basic at-home treatment. Our doctors and board certified vision therapists provide innovative vision therapy that incorporates coordinated movement, balance, auditory processing and cognitive skills. We address convergence insufficiency and other vision problems with a personalized approach. Each session is one-on-one (therapist-to-patient), conducted under doctor supervision. Our providers utilize the most advanced technology including in-office and home support virtual reality. This treatment model gives our patients the visual abilities they need to succeed in and outside of the classroom.